Natural phenomena consist of simultaneously occurring transport processes and chemical reactions. These processes may interact with each other and may lead to self-organized structures, fluctuations, instabilities, and evolutionary systems. 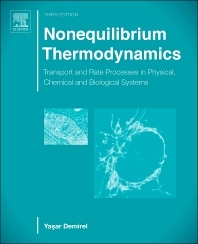 Nonequilibrium Thermodynamics, Third Edition emphasizes the unifying role of thermodynamics in analyzing the natural phenomena. This third edition updates and expands on the first and second editions by focusing on the general balance equations for coupled processes of physical, chemical, and biological systems. The new edition contains a new chapter on stochastic approaches to include the statistical thermodynamics, mesoscopic nonequilibrium thermodynamics, fluctuation theory, information theory, and modeling the coupled biochemical systems in thermodynamic analysis. This new addition also comes with more examples and practice problems.